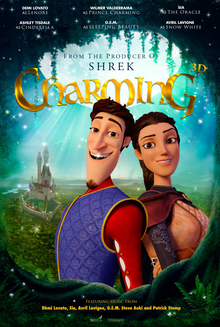 Charming is a 2018 Canadian-American animated musical comedy film directed and written by Ross Venokur. The film features the voices of Demi Lovato, Wilmer Valderrama, Sia, Ashley Tisdale, G.E.M. and Avril Lavigne. Prince Phillipe Charming is a prince who was cursed nearly twenty one years ago by his father's former partner Nemeny Neverwish. Jealous because he wouldn't marry her, Nemeny has placed a curse on the young Charming. With an overdose of charming powder, Charming has the ability to instantly bewitch every woman in the land, at least he does until his 21st birthday, when all the love in the world will disappear. The only way for Charming to break the spell is if he finds his true love. However, with his 21st birthday nearing, Charming has proposed to not one but three bachelorettes; Cinderella, Snow White and Sleeping Beauty, who are all unaware that they're engaged to the same guy. Growing tired of his flippancy, Charming's father kicks him out of the house to go on a quest known as the Gauntlet, and along the way true love begins to blossom. Lenore is a jewel thief who has also been cursed by Nemeny Neverwish, only her curse gives her incapability to love. To avoid the royal guards, she hides in a bakery whilst Charming's fiancées walk in. Posing as a baker and stealing all their possessions, she breaks the bad news that they are all engaged to Charming, which causes scandal throughout the kingdom. Lenore is arrested and bribed by the princesses's three guardians to run the Gauntlet with Charming to a place called Fire Mountain. She agrees, just in exchange for their riches. To avoid any more run-ins with the royal guards, and knowing how Charming reacts in front of women, she poses as a man named Lenny. Charming and Lenore travel through many obstacles towards Fire Mountain. First they are attacked by a tribe of giant women known as the Matilija, but Charming's charm saves the day, preventing them from being eaten. While Charming gets anointed by nearly all the Matilija, Lenore is taken in by the Half Oracle, who informs her that Charming might be her true love. After obtaining the chief's "hairpin", Charming manages to cut Lenore free from her chains. After escaping, and returning a ruby heart to a tone monster, Lenore starts to develop feelings for Charming, and sets up a date at the Dainty Dish, a local eatery. However Nemeny finds out about this and casts a curse that draws all the women in the area inexplicably towards Charming. Lenore is heartbroken at seeing Charming surrounded by other women. Yet the two continue, and they make it to Fire Mountain, so Lenore is given her reward. Charming is confused by Lenny's cold demeanor after his trip to the Dainty Dish, at which point Lenore tells Charming the truth about her disguise. Although she felt that she had betrayed him, Charming tells her that he still loves her, but she refuses to listen to him. Charming reveals that he does not really love his many fiancées, and is sentenced to execution. As he is about to be hanged, Charming speaks to his self-sacrifice. Nemeny comes to bring about the final chapter of her curse before Lenore comes to rescue Charming. In an attempt to save her from one of Nemeny's attacks, Charming sacrifices himself. As Charming lay dying, Lenore recalls true's love's kiss, and uses it the restore him and all the love in the kingdom. The spell is removed and Nemeny is defeated. The two get married in the end, and prepare themselves for their "happy beginning". On September 18, 2014, it was announced that producers John H. Williams and Henry Skelsey's newly formed animated production company 3QU Media would be developing its first film, Charming, with Vanguard Animation, and in association with Cinesite. Ross Venokur will direct the film based on his own script, and the film's budget would be under $20 million. On February 19, 2015, Demi Lovato was cast in the film to provide her voice for the female lead role of Lenore, and she will also executive produce the music score for the film. On August 5, 2015, Avril Lavigne, Ashley Tisdale and G.E.M. joined the cast to voice Snow White, Cinderella and Sleeping Beauty, respectively. SC Films International will handle the international sales for the film. Wilmer Valderrama was cast as Prince Charming on September 16, 2015. Production was done at the new animation studio Cinesite in August 2015 in Montreal. On June 28, 2017, it was reported that a newly launched distribution company, Smith Global Media, had acquired distribution rights to the film. In November 2015, it was announced that Lovato will be responsible for the executive production of the soundtrack. Australian recording artist and songwriter Sia wrote two songs; "Magical" and "Baladino", performed by Lovato and Sia, respectively. Also, Fall Out Boy frontman Patrick Stump penned a song named "Trophy Boy", which will be sung by Lavigne, Tisdale and G.E.M., which Tisdale confirmed on her Snapchat to her fans. The soundtrack is set to feature music from Steve Aoki as well. ^ a b c d e Berkowitz, Jeremy (August 5, 2015). "Avril Lavigne, Ashley Tisdale, G.E.M. join 'Charming'". Screen Daily. Retrieved May 28, 2017. ^ "Charming". Box Office Mojo. Retrieved November 15, 2018. ^ a b McNary, Dave (February 19, 2015). "Demi Lovato Joins Animated 'Charming' Movie". Variety. Retrieved August 5, 2015. ^ a b c d e f g h Otterson, Joe (August 5, 2015). "Avril Lavigne, Ashley Tisdale, and G.E.M. Join Demi Lovato in Animated Comedy 'Charming'". The Wrap. Retrieved August 5, 2015. ^ Pedersen, Erik. "Wilmer Valderrama Sweet-Talks His Way Into Princely 'Charming' Role". Deadline. Retrieved 17 September 2015. ^ "Steve Aoki on Twitter". Twitter. Retrieved 2016-02-29. ^ a b McNary, Dave (September 18, 2014). "'Shrek' Producer John Williams Launching Animated Production Company (EXCLUSIVE)". Variety. Retrieved August 5, 2015. ^ Sollosi, Mary (September 16, 2015). "Wilmer Valderrama to voice Latin Prince Charming in animated fairy tale Charming". Entertainment Weekly. Retrieved January 5, 2016. ^ Hipes, Patrick (June 28, 2017). "Newbie Smith Global Media Acquires Animated Pics 'Gnome Alone' & 'Charming'". Deadline. Retrieved July 4, 2017. This page was last edited on 25 March 2019, at 00:00 (UTC).